An orphan boy named Tree-ear lives in a village in 12th-century Korea. Tree-ear lives under a bridge with Crane-man, a very nice but destitute vagabond. Tree-ear’s story begins after watching a potter named Master Min make flawless potteries. Nowadays, it’s hard for us to imagine how bad conditions might be if our parents passed away. Often times, books are not just elucidating a story to us, but also teach us lessons for life. When children in our modern society are asking for a brand new iPhone X, Tree-ear was busy scrounging for food. One day, Tree-ear was a little avid to take a peek at Min’s pottery, so he sneaked into his backyard but accidentally broke a pot. You can’t really say it’s a calamity for him, but a surprise. As recompense, Tree-ear lived in Min’s house and learned how to make potteries until one day he was being sent to the King and exhibit him Min’s masterpiece. It wasn’t until the village dwindled its shabby shadow he realized that his life’s been edited. This book incorporated a lot of life lessons that everybody needs to learn. If life gives you an absinthe, someday you will receive a fondant. A Single Shard by Linda Sue Park is available for checkout from the Mission Viejo Library. 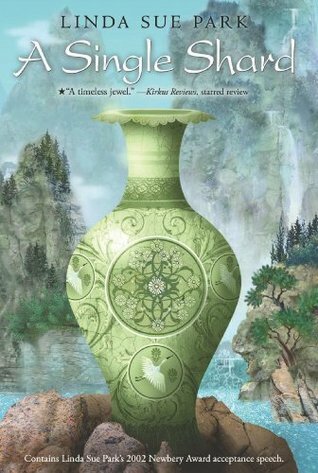 This entry was posted in Book Reviews and tagged art, historical fiction, Korea, perseverance, pottery, poverty by aprilauthor. Bookmark the permalink. I remember reading this in 3rd grade or so and writing a book report for it! Hardly remember anything about the plot however.